Attractive pair of carved walnut 'His and Hers' antique fireside armchairs for reupholstery. 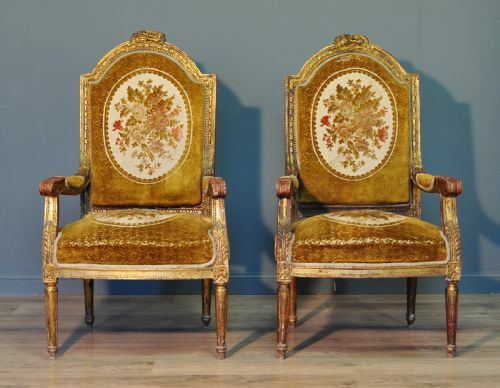 An attractive pair of antique carved walnut armchairs for reuphostery. We date these armchairs to the second half of the 19th century. The armchairs sit on turned legs at the front and backward curved oblong section legs at the rear, all above their original ceramic castors. One chair is slightly larger than the other and has the addition of armrests. The chairs have been upholstered in a dark red patterned velour material with a button back rear backrest. The material is showing a fair amount of wear with some holes and wear to the braid. The larger armchair has a height of 38.5" (98cm) with an overall width of 28.5" (72cm) and an overall depth of 31" (79cm). It has a backrest height of 24" (61cm), a seat height of 16" (41cm), a seat width of 20" (51cm) and a seat depth of 21" (51cm). The smaller armchair has a height of 36" (92cm) with an overall width of 23" (59cm) and an overall depth of 27" (69cm). It has a backrest height of 22" (56cm), a seat height of 14" (36cm), a seat width of 22" (56cm) and a seat depth of 18" (46cm). 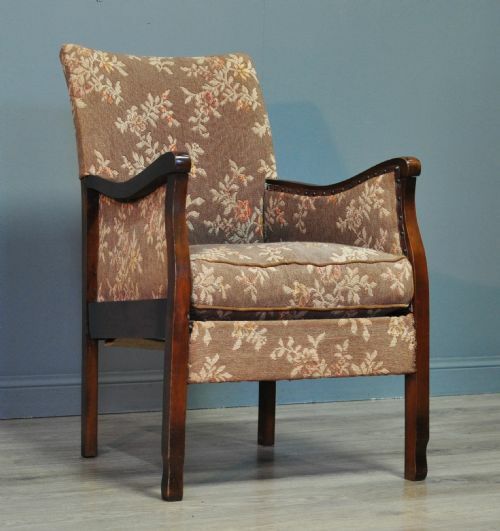 This remains a very stylish and elegant pair of armchairs. They are very comfortable and supportive to sit on and will continue to provide rest and relaxation for many years to come. 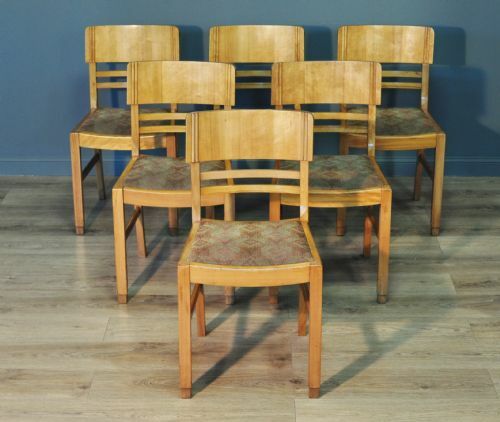 Attractive set of six vintage art deco walnut dining chairs. A lovely set of walnut chairs. We date these chairs to the 1930's. The chairs sit on square section legs at the front and slightly backward curved oblong section legs at the rear. The legs are braced with stretchers. The rear legs continue up, with a slight backward slant to form the back rest side supports. They are joined with a large backward curved backrest. The drop in seat pads have been upholstered in a heavy woven patterned material. The chairs are 32" (82cm) high with a backrest height of 14.5" (37cm) a seat height of 18" (46cm) a seat width of 16" (41cm) and a seat depth of 14.5" (37cm). This lovely vintage art deco walnut chair set remains in good solid condition with only very minor surface markings commensurate with age and usage. There is some very light surface marking and scratching to the surfaces from past use and the material is showing a little bit of wear with some minor marks. This remains a very stylish and elegant chair set. This chair set will continue to provide good service for many years to come. 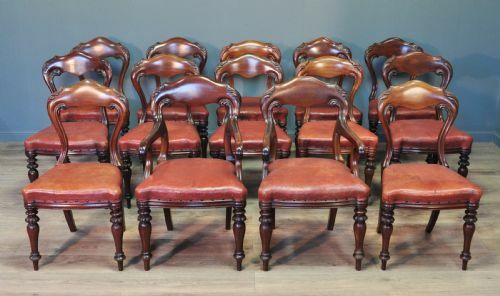 Attractive set of six vintage mahogany dining chairs. 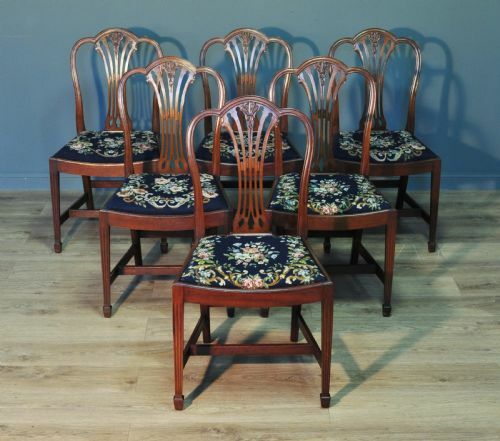 A lovely set of six vintage dining chairs. We date these chairs to the first half of the 20th century. The chairs sit on downward tapered, square section legs at the front with spade feet and slightly backward curved downward tapered oblong section legs at the rear. The legs are braced with 'H' stretchers. The rear legs continue up with a slight curve to form the back rest supports, which are joined by arch top cross rails and attractive vertical spars. The drop in seat pads have a floral patterned tapestry cover. The chairs are 37.5" (95cm) high with a width of 20" (51cm) and a seat depth of 16.5" (42cm). This lovely set of dining chairs remain in very good solid condition with only very minor surface markings commensurate with age and usage. There is some minor indentations to the frames and some marks to the material on the pads. There is a bit of wear to the bottom of the legs and stretchers from past use. Attractive set of four vintage stacking chairs. 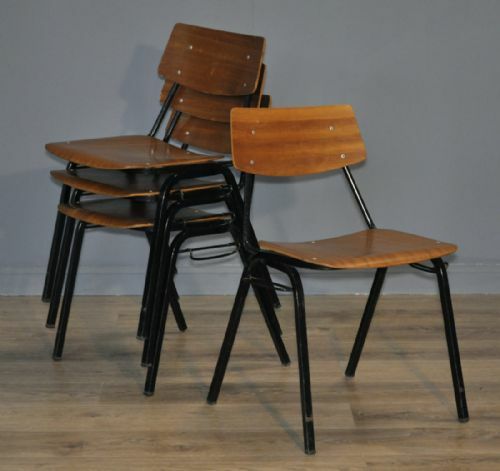 A lovely set of four stacking chairs. We date these chairs to the 1960/70's. The chairs have steel frames with veneered seat pads and backrests. The frames are designed to be stackable and have a latch at each side allowing the chairs to be interlocked if required. The chairs are 29" (74cm) high with a width of 20" (51cm) and a depth of 18" (46cm). This lovely set of chairs remain in very good solid condition with minor surface markings commensurate with age and usage. There are some slight water marks to the wood on some chairs and there is a bit of wear to the original painted finish on the frames from past use. There are some minor veneer chips to some edges of the wood. This remains a very stylish and elegant set of stacking chairs which will continue to provide sterling service for many years to come. Please contact us if more sets are required. 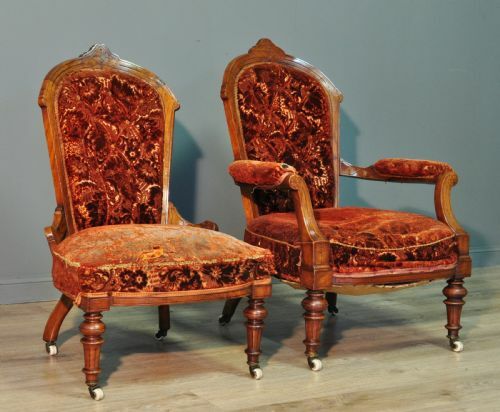 Attractive pair of antique Queen Anne mahogany chairs. 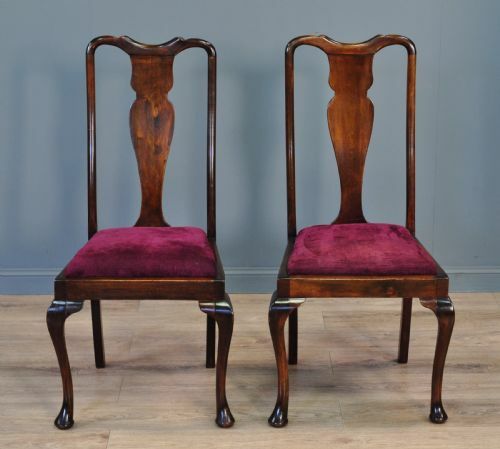 An attractive pair of mahogany chairs. We date these chairs to the early 20th century. The chairs sit on cabriole legs at the front and backward curved oblong section legs at the rear. The rear legs continue up to form the backrest side supports. The backrests of the chairs have a shapely central splat. The chairs are upholstered in a dark purple velour material. The fabric is in a good usable condition but has some minor usage marks from past use, specifically to the front edge of one chair. Please note that we have not attempted to have the chairs professionally cleaned. The chairs have a height of 41.5" (105cm) with a backrest height of 24" (61cm), a seat height of 18" (46cm), a seat width of 21" (53cm) and a seat depth of 16" (41cm). This attractive pair of mahogany chairs remain in good solid condition with only very minor surface marks commensurate with age and usage. There is a little bit of wear to the finish from past use. This remains a very stylish and elegant pair of chairs. They are very comfortable and supportive to sit on and will continue to provide rest and relaxation for many years to come. An attractive small armchair. We date this armchair to the mid 20th century. The chair sits on square section legs at the front and at the rear. The armrests have attractive scroll shape to the ends. The armchair is upholstered in a brown floral designed heavy woven material. The armchair has an overall height of 33" (84cm), a depth of 26" (66cm), a width of 21" (53cm), a seat height of 17" (43cm), a seat width of 16" (41cm) and a seat depth of 19.5" (50cm). This attractive armchair remains in good condition. The material is showing some minor signs of wear and the arms have a few minor marks and indentations. There is a very small amount of play in the frame. This remains a very stylish and elegant armchair. It is both comfortable and supportive to sit on and will continue to provide sterling service for many years to come.